Twice winning the AL Most Valuable Player award (1927 and 1936), Gehrig played in 2,130 consecutive games, an endurance record that stood until Cal Ripken, Jr. broke it 1n 1995. He retired a year after learning that he had learning he had the rare degenerative disease, amyotrophic lateral sclerosis (ALS), which is now more commonly known as "Lou Gehrig Disease." 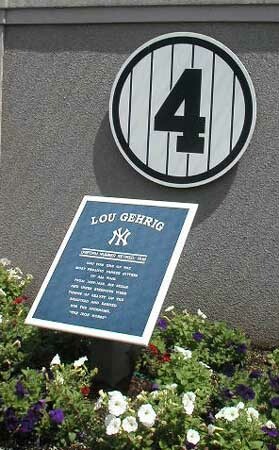 Gehrig was the first player to have his uniform number (#4) retired, and he is immortalized in Yankee Stadium's Memorial Park.